Well, this was a close call. Representatives for Harrison Ford have confirmed that he is resting comfortably in the hospital after an enormous pencil erased his whole face. The actor was reportedly visiting the Disney lot when a pencil nearly as large as Ford himself reached down and scrubbed his facial features off with its eraser. 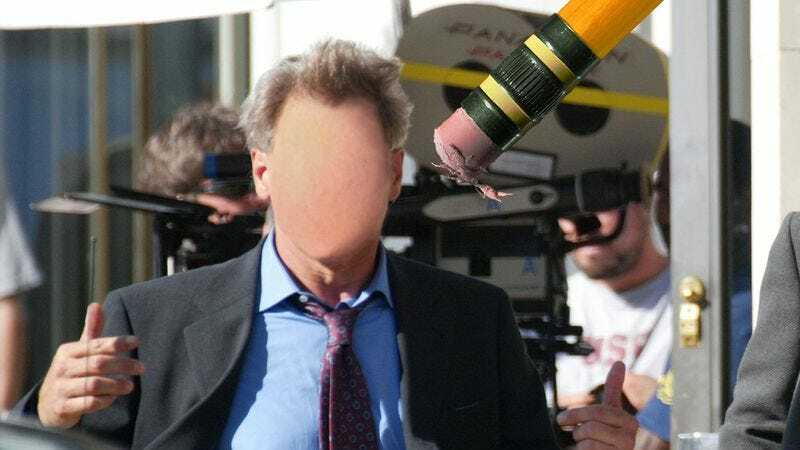 According to eyewitnesses, the faceless Indiana Jones star then pulled a large pencil from his own pocket and scribbled a crude approximation of his face onto his head. When the original eraser returned and jabbed at his ears, the Hollywood legend used his pencil to fence away the gigantic one, prompting it to draw a Three Musketeers–esque costume onto the actor. Ford was then seen throwing his new wide-brimmed hat on the ground and stomping on it. After a brief exchange of blows, the huge pencil was able to redraw Ford’s pencil as a bouquet of orchids, which immediately sagged limp. Ford was defenseless as the pencil repeatedly drew and erased new bodies below his neck, including those of a pelt-clad strongman, a curvaceous woman in a dress made of fruit, and, finally, a chihuahua. Ford protested vigorously, citing his professional status and the indignity of it all, until the pencil erased his mouth. As his face and eyes bulged and reddened with his pent-up objections, the pencil erased the surrounding scenery and replaced it with a monastery chamber before drawing a monk’s robe onto Ford himself. As Ford watched helplessly, the pencil drew a “Do Not Disturb” sign onto the handle of the chamber door and erased the lock, sending him into such a rage that he plowed directly through the door, leaving a hole the shape of his hybridized body and singed edges where his now white-hot head touched the wood. Unfortunately, beyond the room there was only a vast white emptiness, and Ford plummeted into the void. Soon, a humongous brush painted an ocean beneath him, which the A-list actor immediately plummeted to the bottom of, directly into a wide-open giant clam that licked its lips with a huge tongue. While Ford struggled to free his body from the clam, a passing crab pinched his nose, causing it to swell up and throb. At this point, the pencil seemed to take pity on Ford, drawing him an ornate diver’s helmet and restoring his mouth to allow him to take big, gasping gulps of air. Eventually, Ford was able to use his legs to pry the clam open, climb the oxygen hose of his helmet up to the surface, and crawl onto a spit of sandy land the pencil scribbled ahead of him. The Air Force One star then continued along the tropical coastline, which transitioned into an Old West ghost town, the deck of a pirate ship, and a lush prehistoric jungle. Admiring the increasingly sketch-like scenery, Ford nearly walked straight off the edge of a page pinned to a colossal drawing board, only saving himself at the last second by grabbing a broken graphite tip nearby and scrawling a ladder’s rung to hold onto. He then drew a number of rungs in succession, eventually climbing up and out of a manhole in the middle of a Manhattan street, where he was immediately run over by a mattress truck. Get well soon, Harrison! We’ve got your back!